13 Digit 1Line LCD Display. Rotary Encoder and iPod Direct Key. MP3/WMA/WAV/FLAC Files Playback with ID-3 Tag Display. iPod Skip/2 Speed Search Function. Pandora / iHeart Radio App Ready. Android Music Playback with Drive Change. Backup Memory for Tuner Preset. FM/AM 24 Station Presets (18FM, 6AM). Front AUX/USB Inputs W/ Cover. 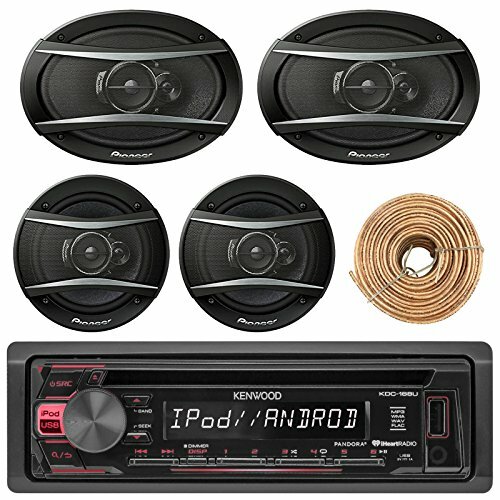 PRODUCT BUNDLE KIT INCLUDES: Kenwood KDC-168U Single DIN In-Dash CD/AM/FM USB/AUX Digital Media Receiver - 1 Set of 2 Pioneer TS-A1676R 320W 3-Way Audio Stereo Speaker - 1 Set of 2 Pioneer TS-A1685R 350W 6.5"/6.75" 4-Way A-Series Automobile Coaxial Speakers - 1 Enrock 50 Foot 18g Wire for speakers. STEREO UNIT: Kenwood's KDC-168U CD receiver includes easily accessible front panel controls to let you control your music, tweak your sounds, pick your favorite radio stations, and crank the volume when the mood strikes you. As far as music choices, you can integrate your iPhone using the Kenwood's USB port. You can even play and control Pandora® and iHeartRadio® using your connected iPhone. built-in amplifier offers impressive power for a big bump in performance over a stock radio.